A group of Santas get together in the off season and here’s what happens! My only shot at being Santa. 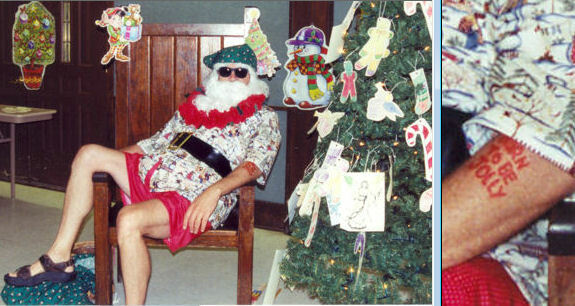 One summer over ten years ago, our church in Baton Rouge had “Christmas in July.” The usual “Santa” was unavailable so I got drafted. It was my only and closest encounter with Sainthood. My wife made me a Hawaiian shirt with Christmas themed material, a do-rag, and I got a temporary tattoo. Flash forward to 2015 and a group of professional Santas (one of whom is a close friend) who couldn’t wait till July. Let’s see what kind of fun they have in April. Were they convening an income tax session? I think not! These guys know how to be jolly and how to get HAPPY! Sing, dance, and clap along with them! My good friend, Art Hoffman, does great video work and had done all my video book trailers. He’s also captured many of the acts at North Carolina’s annual Folkmoot USA festival. See more Santa video and the amazing variety of topics by visiting Art’s YouTube channel, HERE.